← Beauty in our own backyard. At 15 Celina Jade entered a singing competition and won a record deal with Japan’s biggest music producer. She was asked to give up her education to focus on a career in entertainment. After discussing her options with her parents, she went in her room and asked herself a question that set the course for her life. Celina has since graduated with an honor’s degree from the London School of Economics and opened the successful vegetarian restaurant Home in Hong Kong with her partner. You may know her as Shado from the hit television series Arrow, or from China’s Oscar-nominated and highest-grossing film of all time Wolf Warrior 2. If you don’t know her yet, you will. This warrior and wise woman is using her voice not only to sell albums, and portray strong female characters, but to advocate for our planet. 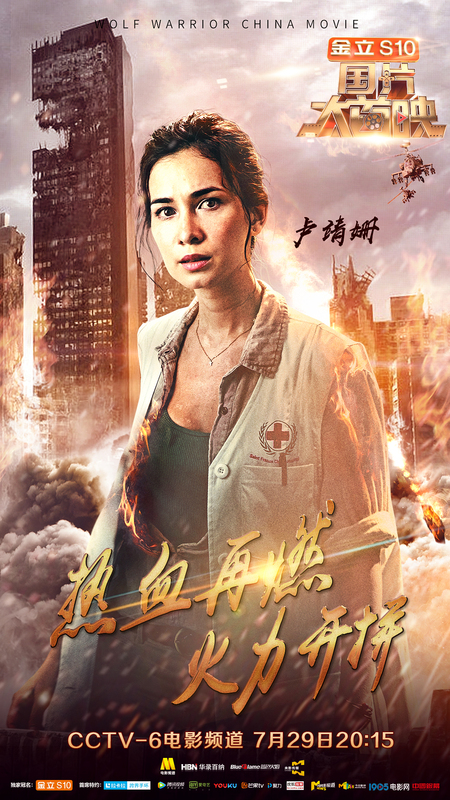 Movie poster for Celina Jade in Wolf Warrior 2. I met Celina through a friend during Paris Fashion Week. I have to admit that I first noticed her pink dress; but it was the kindness, intelligence and joy that sparkled in her eyes that drew me in. I hope you are as inspired as I am. Celina Jade outside Nina Ricci during Paris Fashion Week. Angelique: You seem to have achieved success very young. Celina: My story is pretty much like everyone else’s story. It has its ups and downs. It’s a little more in the public eye than most people, but I think most people have great stories. When I was 15 I went to Hawaii and recorded my first CD. I was singing music that wasn’t written by me. I didn’t have a voice. I was quickly thrown into that commercial music world where you sang songs that people told you to sing. You wore clothes that people told you to wear. It was fun, but it was very different from what I imagined because I always loved music. I was slightly autistic as a kid, or so I was told. But even today I’m not sure that’s entirely true. That’s what I was told by a doctor and music was my only outlet for creative expression. I always wanted to be that singer that was connecting people, like the people I felt I could relate to through music. Here I was realizing that I was more of a commercial puppet than an artist. That was my first introduction into entertainment. My biggest struggle was that the album hit number one in Taiwan, and I was asked to quit school, to pursue a full career in entertainment. We had a family meeting. I went back to my room, and when I asked myself the question “Am I becoming someone I admire?” and I realized I wasn’t. I decided to terminate the music contract and continue my studies. It also made me decide to study economics and management at the London School of Economics because I realized that you can be extremely talented but if you don’t understand the business, it would be very difficult to fully express yourself. I didn’t want someone else to be controlling my career. I did very well. I graduated and then I studied one year of music. I also feel like having an education has really helped me be able to chose my projects, and not having to do things that are against my integrity. 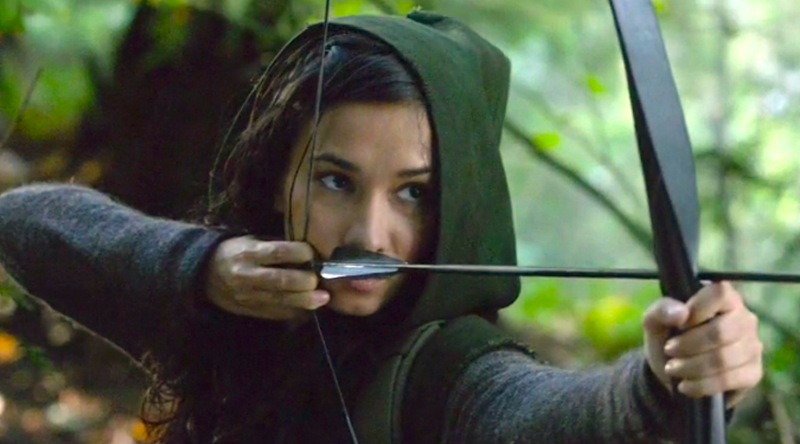 Celina Jade as Shado in the hit series Arrow. Celina was trained in martial arts and archery by her father American actor and martial artist Roy Horan. I never really thought I’d become an actor. I was so afraid to try. I went to Chinese school for most of my life. I was a shy girl. I met Jing Wu 10 years ago and he was the one that convinced me to try out acting. He knew that I could fight because my dad was the token bad guy in the Jackie Chan and Bruce Lee movies. He offered me a lead actress role in his directorial debut. It’s funny because I’m reading The Surrender Experiment, and I realized that what I did 10 years ago was arranging for the opportunities that were coming at me instead of following my economics mind that was telling me “I don’t have pull at the box office. I’m going to cause this movie to fail because I’ve never acted in my life before. I don’t know if I’m qualified to take on this role.” But I did it. I went and I tried. Obviously, the universe is opening this door for a reason. I should try it out and surrender to it. So, its funny to be reading this book now and realizing 10 years ago I was surrendering without even realizing it. Have you read that book by Michael Singer? It’s a great great great book. It lead me to accept a part 10 years later when Jing called me and said “I need a lead actress.” I said “Yes of course, anything for you.” We didn’t discuss contract details or anything. I was on the next flight to Beijing, and it is now the biggest movie in the history of China. A: That’s a crazy story. There’s a lot of strange completions of cycles for me this year. I see how perfectly the universe carved out a part for me in life. It took 10 years of faith and perseverance, of going through highs and lows to see it finally come to fruition in such a perfect manor, in a better way than I ever could have imagined. Which is nice but also exciting to see where it will take me next, and what my dharma is; what my part is in all of this. In terms of how I can use this towards social good and increasing awareness around environmental sustainability, healthy eating, women’s education, and female power. Celina Jade as Rachel Prescott Smith in Wolf Warrior 2. A: Why was it important for you to open a vegetarian restaurant (Home)? Home unfortunately recently closed down and we will reopen, I just don’t know if it will be in Hong Kong again. Healthy eating and vegetarianism actually began for me in 2012 because I got into an accident. I got 3rd degree burns across my chest and arms and my boyfriend at the time told me that I should try eating healthy because food can heal the body. I didn’t know anything at that time. I was a meat eater. I ate seafood, everything basically. He told me to start juicing, cleansing & detoxing my body. I started eating only whole grains and vegetables. I always ate a colorful plate and cut out all dairy, all meats, all seafood, anything with chemicals and preservatives in it. My body healed so fast and so well, that my scars were flat and white. When I went to the hospital, the doctors said that it was a miracle that I was healing so well. I actually gave all of the recipes to the hospital. Following that my whole family learned about food and the importance of healthy eating. So when my mother got pancreatic cancer in 2015, I ended up spending most of my time with her. I was cooking for her, breakfast lunch and dinner, controlling everything in her diet, making sure she was going to classes to increase the oxygen in her body, so that the heat in her body was high enough. My mother was Buddhist so she believes in karma, that if you don’t kill, you can create good karma in your life. So I took a vow when she was very sick and said I will not kill every day that my mom is on this planet and give her all my good karma. My boyfriend at the time, the same guy, was going to start his own restaurant Home, so because I studied business and management I said let’s do this together. We would joke with my mom and say “We will give you all the good karma of feeding hundreds of people in Hong Kong vegetarian food.Instead of putting out a bowl for tips, we’ll put out a bowl for karma points” and give all these points to my mom in hopes that it would extend her life. It was a great experience because I had never really used my degree. I read all the books I could find on restaurants, business and numbers. Christian is a real visionary and this has always been his cause because he lost his mother to cancer and his father to heart disease. We opened this very successful restaurant. There was no waste, we sent compost to the farms each day. There was no plastics, everything was corn based or biodegradable. We reused our oils and made them into soaps that we sold in retail. Every item was named after an extinct or endangered animal to raise our awareness of how our food choices affect the planet. It was amazing because it really became a big part of my life. I really embraced that and realized how important that awareness is. Meanwhile my mother who was given 3 months to live, ended up living more than 2 years. She had surgery, and she couldn’t digest vegetables or the nutrition very well, so unfortunately in the end she passed. It was an incredible experience solidifying my believe in food as a way to health, and it became a big part of my life. A: I’m sorry for your loss. No, it’s OK, it happened with such perfection. My mothers passing was beautiful. I truly believe that she chose such a difficult disease because she was there to teach us many beautiful lessons through this. Whether it’s about food, death, family love, or courage. We gained so much. My mother always said Cancer was the biggest blessing she ever received. She learned grace, love, gratitude. She learned humility. Through her learning those lessons, we also learned them. I always thought death was very scary, but my experience with it was actually very beautiful and very meaningful. It changed my life. Now I live believing in and realizing how lucky I am to have a body to express my soul. To have a body to express love, devotion, creativity, all of those things shouldn’t be taken for granted. So don’t be sorry for my loss, be happy for my loss. That’s what my mom always said. She said “When I leave, you have to celebrate my life and my departure merging into the universe.” And we did. We sang, danced and chanted. We clapped and we said “You made it, we’ll see you again very soon.” Life is very short. When I was a kid I always thought that losing my mother would be the scariest thing of my life. I would cry at just the thought. Somehow the universe only gives you lessons that you’re strong enough to learn and take from. We really do survive, we really do go on, which is a really strange thing because we’re all connected to our mothers through the umbilical cord and it’s such a deep connection, but I feel more connected to my mom than ever now that she’s gone. I joke with my dad that I went to South Africa to finish Wolf Warrior 3 and I felt like she was in my backpack. She hated hiking, and the outdoors. She’s Chinese so she hated the sun, and now I get to take her everywhere I go. It’s nice. I can feel her energy from the universal force coming to heal me, which is very bizarre. We all go through it in our lives. People don’t talk about it. There’s no reason why it has to be a horrific thing. It’s really not how I imagined it. 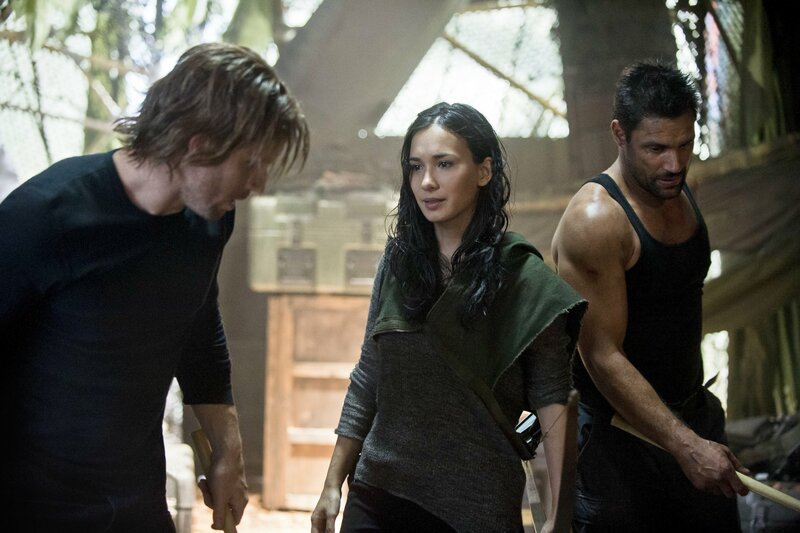 Celina Jade as Shado and Stephen Amell as Oliver Queen / Green Arrow. A: Tell me about your dad. He’s such an interesting character. My dad actually went to the arctic when he was in his 20’s for two years, and he learned that the meaning of life is within. He felt this sounded like Asian philosophy so he went to Asia and studied martial arts and Zen Buddhism. He learned how to control the mind. Martial arts is not about fighting, and self-defense, those are benefits, especially for a woman, and I highly recommend it; but it really is about the control of the mind which is a very important practice. Very often our mind controls us, our thoughts lead to our emotions, and those emotions lead to actions and events, and those events lead to more emotions, and more events, and it becomes this crazy cycle. I think Eckhart Tolle calls it The Monkey Mind. When we can use the mind as a tool to the heart, then we can really find happiness because we’re not thrown into this washing machine, this cycle of thoughts and emotions. He follows an Indian guru. He started meditating and he’s been meditating every day now for 40 years, possibly even more. He brought that discipline to us kids. As a kid it was a way to bond with dad, and dad always wanted a son and he didn’t get one, so it was just the 2 girls. We learned how to fight, we learned how to shoot, we learned archery. Men and women are equal, we are just as strong. We should be just as confident. It was a beautiful upbringing. A: Was it difficult being trained by him? Yes. Fathers teaching kids is the most difficult because they have the highest expectations, they know when you’re just being lazy and don’t want to wake up early. They know when you’re not fulfilling your full potential. We never learned in a structural way, we learned in a philosophical and spiritual way. A: How do you meditate? I also follow a guru in India. It’s called Siddha yoga. Every day I meditate through the breath, through the mantra, and through the mind. I meditate through surrendering. You have to read that book, it’s so good. I’ve always been a bit of a control freak, for my whole life, and losing my mom was the final straw in realizing we absolutely cannot control anything. I realize that sometimes my ego’s tendency to think that I can change certain things actually holds me back. More and more I try to live life through that calm and peaceful state that exists within the heart, and somehow listening to that ends up taking me in the right direction, even though sometimes the direction at the time may seem absolutely insane or nonsensical to my mind. A: Can you give us an example of a crazy choice you made because your heart told you to? When my mom first got diagnosed with pancreatic cancer, I was the first person to the hospital. I remember saying to her, and this completely came out of my heart from this meditative state I was in, I said to not do chemotherapy or radiation, which was against all the doctor’s advice. My mom was considering doing all of those things because she wanted to be a responsible mother for her children even though she knew somewhere deep inside of her that it was her time to go. It was the time to accept that she was going to die. When I came to the hospital I said “If you die one week from now, I want that week to be full for you instead of trying to fight reality, its accepting reality and living it happily and painlessly. Just know that you’ve already been a great mother. You have already changed our lives in the most significant ways.” My mind was saying “Celina, you’re crazy, but I would rather we have that time with each other.” There were many times when I thought “I should be doing all this research and spending all this time calling doctors and getting third opinions, fourth opinions, and do all these tests”. Then I realized I’m losing all the time with her, minute by minute, losing the time that God’s gifted us. It’s not a sudden death. She had that time. We all knew that it was the right thing. Was it difficult – yes? We fought the world, all of the friends, and some extended family thought we were absolutely insane because the thing to do is to listen to the doctors. But actually, she ended up outliving all the doctor’s timelines for her, even had she done chemo and radiation. A: Why is being a vegetarian important for our planet? For a long time, my understanding of being environmentally minded meant recycling, or turning off the lights, or not running water all the time. All of those things I thought were choices we could make, to help the planet. The alarming facts around how raising animals affects our planet speak more than me talking about it. Celina Jade at the 2017 Mumbai Film Festival. Photo by Singh Tejinder. A: This may be a myth but I have to ask, how are you able to eat a vegetarian diet and not be hungry? (She laughs.) That’s so funny. Do you ever have a plate of pasta and you’re still hungry? You’re like I want more, I want more. The reason for that is that our body creates hunger when we are dehydrated, so the first thing you should do is drink water. The other time you feel hungry is when your body lacks nutrition. If you eat a very nutritional vegetarian meal, you actually are not hungry at all. If you go have sweet potatoes, kale, a very colorful meal with quinoa and couscous, you won’t be very hungry. What you might find is that being a vegetarian you digest faster. You might poop more often than if you’re eating a meat diet which is great because you’re detoxing. You’re supposed to go to the bathroom twice or three times a day, which I never knew. But you will want to eat more meals because your digestive system moves faster. You could be an unhealthy vegetarian. It’s not recommended to be a vegetarian if you don’t understand the importance of eating all kinds of vegetables. Sea vegetables, root vegetables, leafy vegetables. If you are very picky than I would not recommend becoming a vegetarian. Most importantly it’s not so much about being strict, you also have to listen to your body. Some people have to have fish. If your lacking vitamin B and you want to have a little bit of meat it’s OK. You don’t have to put yourself in a box. But if you do want to be good towards the environment and you do want to make a positive choice in your eating style, then try to eat more vegetables. Have fewer meat selections during the week. That would already make a big difference. A: You are a powerful role model. What are your messages to young women? Go to school. Enjoy that time and don’t give up your childhood too quickly. One of the great questions to ask yourself at many stages in your life, is “Am I becoming someone I admire?” Because what a beautiful thing it is to be able to admire ourselves. We have to work towards that. Why idolize people when you can that find that kind of love and devotion towards yourself? If you have a dream, go for it but make sure that you protect yourself. Have a bottom line. How do you create that bottom line? You create it through making sure you have enough resources under your belt of knowledge, of skill sets, to get you to your goal. I believe in equal opportunities for men and women. But it’s also beautiful to be a woman. Embrace the feminine. We don’t have to be clones of one another. Individuality is beautiful. Differences are beautiful. Being a woman is an incredible thing. We don’t have to become men. Striking that balance and finding love for ourselves, and through that love we are able to support many people. That’s the role, to nurture not just our children, but each other, and create communities to care for each other. That’s my two cents. A: Who are you heroes and why? My heroes are people out there serving the world in a positive way. I’m not really one to idolize people in entertainment or sporting industries or whatever, but people who are selfless are my heroes. They can come in many forms. They could be doctors, saints, monks, or a very wealthy person that dedicates their time to animal protection. There are so many ordinary heroes that may not be in the public eye. A: How do you define success? I really don’t define things by success because by saying success you are also saying failure and I don’t really believe in that. When I was younger I’d say failure is the success of what learning what not to do next time. But now I as I get older I don’t really believe in judging an outcome, because sometimes the worst thing is one of the most beautiful things, sometimes the best thing in the average perspective is the most unfortunate thing, so it’s just not as clear cut as success and failure. I think what’s more important is living each moment fully with no regret and being willing to step out of your safety zone, and realizing whether you succeed or fail, that you took that step and there no lions that are going to eat you. That’s exciting to me, because if you close doors rather than walk through them, there’s so much you’re going to be missing out on. So let’s throw away the result and just enjoy the process. A: Love it. How can we change the world? “Be the change you want to see in the world.” Let’s go with Gandhi’s advice. 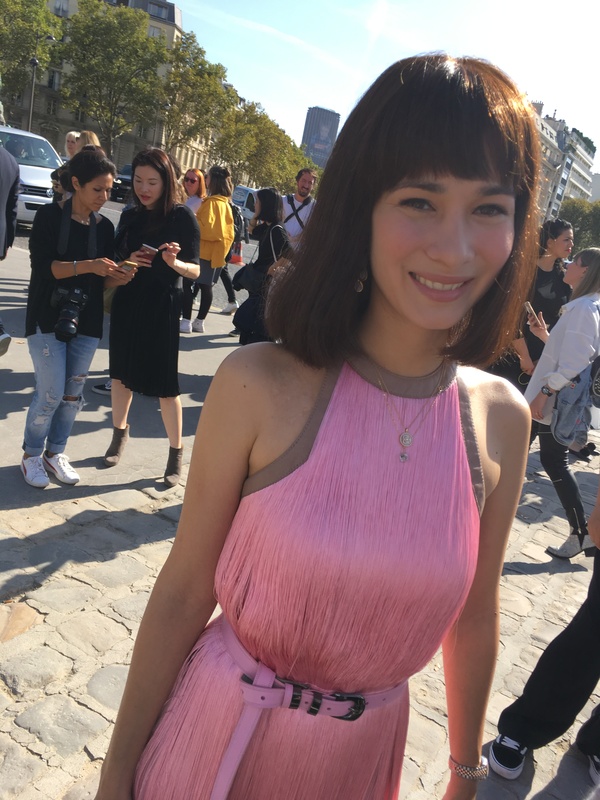 Photo of Celina Jade at Paris Fashion Week taken by me. All other photos used with permission from the artist. Celene was a wonderful “Shado,” an admirable character who inspired many girls and women. She’s also a beautiful woman, intelligent and skilled. I admire her for what she stands for. I’m inspired to be more vegetarian, to take up archery again, and to be good to my body for health’s sake.